François Martin, WW Marketing Director Graphic Solution Business at Hewlett-Packard. • HP’s Francois Martin explains in an excellent way how to benefit from graphic solution technologies to do a better, sustainable marketing job — hitting the ”Zeitgeist“ perfectly. • His main target is to transform the product and solutions offerings of HP GSB into a valuable, customer centric and effective marketing communication success for his own purpose and for his customers and the customers of his customers. • He shows how to make the right step from technology innovation to market success by bringing Brand Owners/Agencies and Print Service Provides closer together and fulfilling their needs smartly. It cuts through email clutter by getting into the home to make an emotional connection. It uses content and storytelling to build awareness and purchase intent. It offers customers a chance to browse (vs. searching on a website). It can be integrated with online tactics: digital editions, mobile apps, social media, and commerce websites. It lets you finely target your list for both acquisition and reactivation of lapsed customers. It provides tangible, measurable ROI. Consumers know the brand ”HP“ very well, but Marketing and Communication professionals don’t recognize HP as an innovative brand for their specific business tasks. 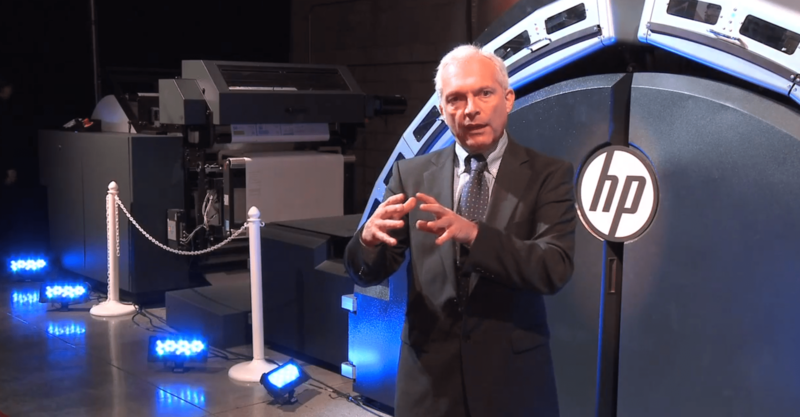 Do you think HP need to change the corporate brand communication strategy? Francois Martin: No. The Corporate Communication from HP is around a new style of IT addressing large corporation. The Graphics Solution Business of HP (GSB) aiming at Marketing and Supply Chain Managers sitting in large Corporation needs to be addressed by one to one communication and then linked to Print Service Providers who make it happen. What has been the most effective marketing campaign for HP GSB? If we address Print Service Providers the best campaigns are showing them a real sample, then showing them how it was produced in the demo center and then explaining the economics around it as they go beyond pure printing costs of a given item. Addressing Brand Owners — show them a great marketing campaign done either by a competitor or in an other industry they can leverage. Once they are impressed or inspired they will want to know if they can do x, y or z and this is when they want to talk to a Print Service Provider who can tell them: Yes we can do it! — All start with an idea. What differentiates the current and the future Marketing challenges for HP GSB? Francois Martin: Marketing is surfing on social trends – all is now mobile and social and all is in the ”Cloud“. This means that whatever you do has to be meaningful to small groups of people and to change fast as everything tend to have a short life. Having said that you quickly understand digital is the best way to reach to your customers — either all virtual and mobile or printed in their mailbox, in the shops, on the shelves. This is not about the how but the what — if you have great ideas, it will can be done. In GSB our challenge is too remove perceptions about the power of print. Print has so much legacy. Some pages will disappear, others will emerge. Too many people refuse to see where print will go in a world where ”me“ as an individual need to be seduced and convinced — and it can not be done by email, blogs, Facebook and tweets only as it would be too easy. We are living in a world where all the content is liquid taking any shape anytime anywhere. It is about surprising the most. What makes HP GSBs marketing communication approach surprising or unique? Francois Martin: Our communication in unique in a sense that we need to address both the printers who print and the brand owners who ultimately order the print from the printers. They both need to spend more time together to understand how digital has already transformed the world in which they leave. Honestly, who could have said, that Coca-Cola would produce more than 1 billion bottles using digitally printed labels to support one of their biggest campaign ever? How do you plan to strengthen the combination of innovative HP GSB products/solution with the right Marketing strategy? Francois Martin: It is about addressing the Brand Owners and the Print Service Providers where they are and using the terminology they understand. It is about showing tangible benefits around digital printing and no longer explaining the size of the dot and the speed of the press. Where does the profitable print volumes come from in the future? Francois Martin: Profitable Print volumes come from applications using either/or variable data printing, nice substrates, versioning to communicate a valuable content to raise emotion like I did not knew, I am impressed, super, can I know more, they do this? How does HP GSB react to change in consumer behavior (infected by Mobile and Social Media)? How does HP GSB interact with the relevant customers to push innovation? Francois Martin: We are working closely with leading companies who set challenges for HP — we work closely with them to understand the type of features we need to enable to shape and built a brighter future for both the Brand Owners and the Print Service Providers. To illustrate with names, we worked closely with Coca-Cola to make their ideas reality even developing a unique Coke Red color and special service capabilities to enable 24/7 printing on the HP Indigo WS6600 press. We worked closely with the leading EMEA book printer called CPI to develop our high speed inkjet web press which today help them to print many titles who no longer can be managed in traditional offset printing processes. ”Six reasons Digital Print belongs in your media mix” — Great insights. Great Interview. TX to Francois Martin.